Kemco has been steadily supplying gamers with a glut of RPGs through the 3DS eShop over the past few years, all ported from mobile and mostly middling in the truest sense of the word — decent but forgettable games that riff off of classics. As the company's latest release, Legna Tactica is a dependable continuation of that policy, though in a slightly different genre: it exchanges the town-to-town adventuring of the JRPG mold for the grid-based tactics of strategy-RPGs in the Fire Emblem vein, to predictably decent success. It has a few fun ideas and will certainly scratch a specific itch, but everything here's been done better before — and many times over on the 3DS to boot. 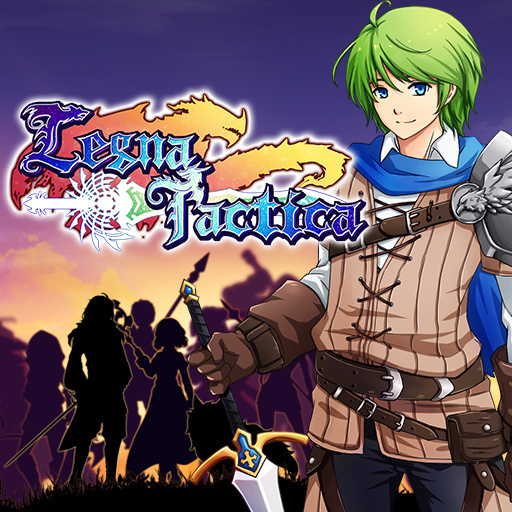 Legna Tactica's curtain opens on a trio of orphans — Leck, Miana, and Astar — in the middle of military training. Together since childhood, they lost their families in the ongoing war between the Kingdom of Legna and the Empire of Izmoot. Hoping to help end the conflict once and for all, Leck and his friends have enlisted in the Legnan Army as trainees — and that's where you come in to guide them. 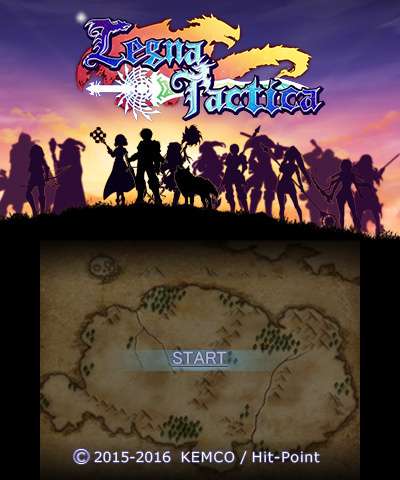 The narrative in Legna Tactica is textbook tactical-RPG, with its mix of macro-conflict between nations and micro-conflicts between characters, and while that's almost a given for grid-based warfare, the best of the genre — think Fire Emblem or Stella Glow — can spin a truly compelling yarn out of the formula thanks to strong characters and charming writing. Unfortunately, Legna Tactica boasts neither. Tired archetypes abound and characters read almost as clichéd caricatures of themselves — Leck the bumbling accidental hero, Miana the devoted sisterly healer, and Astar the aloof prodigy — and the writing bounces between serviceable and almost parodical; when an army member excitedly exclaims "The Continent Survey Team is all anyone's talking about these days! ", you can almost imagine it in blurry '90s anime subtitles. Even if the story won't do much to endear you to Legna Tactica, however, the tried-and-true gameplay template is happy to take up some slack. 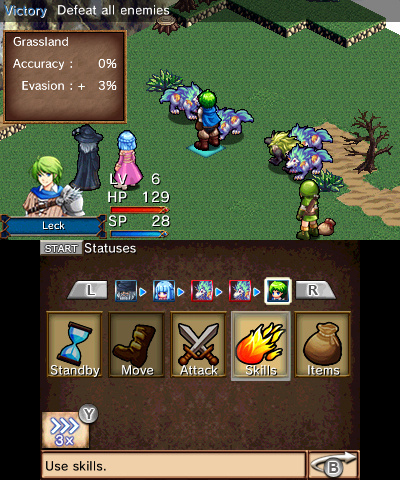 Leck and company's quest unfolds through a fairly typical strategy-RPG formula, heavily inspired by Final Fantasy Tactics and similar titles: you'll direct your army across a gridded, isometric map, moving your soldiers one by one — in a fixed turn-order — and choosing to either defend, attack, or cast spells on enemy units within range at the end of their turns. It's chess-like, engaging and strategic, and positioning plays an important role — attacks do more damage when they hit from behind or from the sides, so you'll want to end each turn with your back covered, and make sure to take advantage of enemy blindspots. One of our favourite little bits of personality in Legna Tactica is directly related to this: when one of your party members dies in battle, they'll leave an immovable tombstone behind where they fell. Not only does this serve as a poignant reminder of their sacrifice, it also makes for an excellent cheeky cover opportunity — line your archer up against the cold marble of their fallen comrade's monument, and no one will be able to catch them from behind! Individual skirmishes between units take place on-field and with no cut-in cutscenes, which makes them quick if less interesting than they could be, and victory conditions vary — though the day is usually won by destroying all-comers, occasionally you'll be asked to guard a certain unit until reinforcements arrive or take out a specific baddie before the rest. 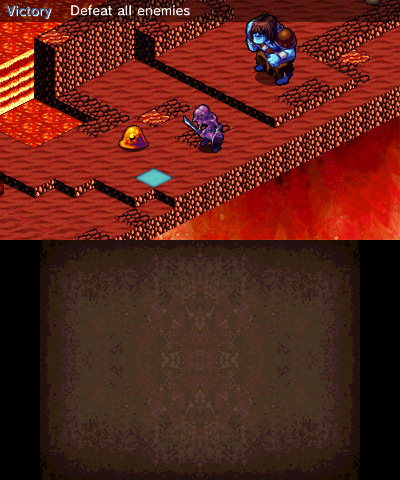 Bags of treasure and other spoils of war also pop up on the map from time to time, and seeking these out provides occasional diversion from the main battle at hand. Environmental effects come into play as well, with attack bonuses for going from higher to lower ground, and certain terrain types — like snow, lava, or desert — affecting hit rates, movement, and more. This core gameplay certainly isn't anything new, but it's remained popular for a reason, and the nuts-and-bolts of battle on offer here provides plenty of derivative fun. The menu-based interface can be a bit clunky, and we miss a few quality-of-life features from similar titles — especially the option to adjust the isometric control, which is hard-wired to 'up' on the D-Pad as northeast — but there are also some welcome touches, like selectable 2x and 3x speeds to quicken the pace of movements and animations, and any-time temporary saves to make mid-commute conquest possible. As you battle, you'll earn both group EXP and individual proficiency points, the latter of which can be used to acquire new techniques and skills for your troops. 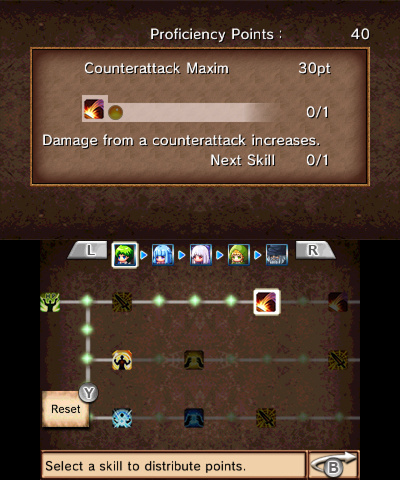 Each character's skill trees are filled with Etrian Odyssey-style branching paths, with the very welcome option to reset and respec at any time, so you're not stuck with a particular build if it turns out to not suit your play-style. One addition to the formula we enjoyed is the 'Titles' feature, an achievement system that rewards you with gold, items, or proficiency points for completing in-game tasks, like stealing from enemies 15 times or landing a certain number of critical hits. Tying these in to skill-boosting bonuses makes them feel much more meaningful than simply ticking boxes on a check-list, and like they were thought through beyond simply being a carrot to dangle in front of completionists. Aside from those useful achievements, Legna Tactica might not stand out too much from the SRPG template in its gameplay, but it does have a bit of a unique look. It uses large, colourful sprites that sit stylistically somewhere between the 16- and 32-bit eras, but remind us of the pre-rendered units of Ogre Battle 64 more than anything else. These tall character sprites look good, as do the larger 2D portraits that accompany their dialogue delivery, even if they feel a bit uninspired in terms of art style — most of the main cast look like they could've been dropped in from RPG Maker templates. There's also no stereoscopic 3D support, so it's an entirely 2D experience. Battle backdrops are heavily tiled and repetitive, but they do have some occasionally inspired touches, like animated water cascading off the edge of the floating battlefields, and pretty watercolour backgrounds behind them. In general, however, Legna Tactica takes after Kemco's other eShop JRPGs graphically, and falls short in comparison to more visually intricate genre-mates like Mercenaries Saga 3. That said, we did appreciate the colourful world on display here, which is in some ways more enjoyable to look at than Mercenaries Saga's sombre sepia tones. The sound design continues that trend, with pleasantly upbeat orchestral tracks featuring some surprisingly full-sounding synthesized strings and horns. The music is quite nice — one of our favourites of Kemco's soundtracks — but the transitions between tunes are often hilariously abrupt, a fact that's particularly salient in the (not infrequent!) switch between 'normal' and 'emotional moment' melodies. Legna Tactica is a thoroughly middle-of-the-road experience; a serviceable clone of classics that fails to impress or distinguish itself beyond its influences. 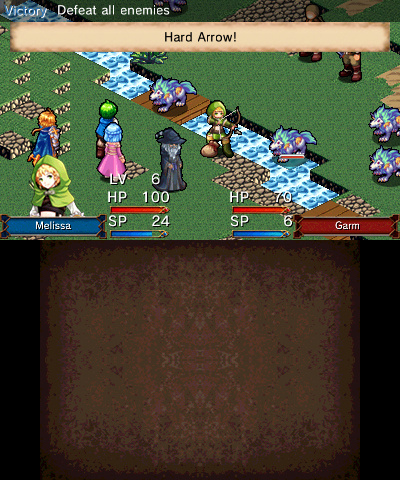 The SRPG gameplay at its heart is engaging and decently diverting, but bland characters, subpar writing, and a modest (perhaps slightly disappointing) presentation make it a tough recommendation in light of its company — if you're looking for a Final Fantasy Tactics clone, Mercenaries Saga 2 and 3 both fulfill the same role with more polish and a lower price tag. Otherwise, spend the extra gold for Stella Glow, Fire Emblem Fates, or Devil Survivor 2 — three of many tactical options with considerably more charm. If you've played through all of those alternatives, though, this is a diversion to keep you busy. Glad this wasn't a must buy. Don't want anything getting between me and my Zelda/Switch! @Spoony_Tech Spoilers: the Switch itself isn't a must buy. That statement is a punchable offence. You don't need games for switch, clicking and unclicking the joycons is enough. I think I might like this. 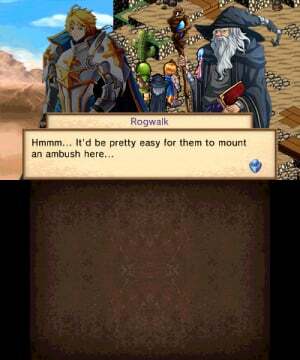 Hated Fire Emblem Fates but LOVED Mercenaries Saga 2. Wonder how this compares to Ambition of the Slimes. Still not willing to put money down on Stella Glow. Story looks dull and too long. Appreciate the specifics on alternatives. Great the 3ds has such choice in some specific genres. Its free on Amazon underground. Worth a look at least. @Shogun474 Ambition of the Slimes is fantastic! I'd def recommend that one first! Well.....it's a Kemco game. Generic is kinda their thing really. Being generic is stable and allows them to continuously churn out more and more games, which gives them more and more chances to make some kind of profit. Eventually. @zipmon Thanks, I think I'll play that next. Especially at the price it's at. Nah, too bland for my tastes. By the way, it's nice that you got this review out pretty quickly, but when are you guys going to catch up on your review backlog? There are several RPGs and (strangely) breakout games among others that are still awaiting reviews, some of them even dating back as far as last August! Get to work, guys! @Shogun474 Stella Glow is certainly not dull, and is in fact in my top 3 games for the 3ds in which I own and have played over100 games on. The combat is great, there is some interesting ways to level your characters through non battle means. I suggest giving it a try used, cause at GameStop you have 7 days to return it. @zipmon good review, I'll pass on this game, but since you recommend Ambition of Slimes, I might have to try that next. The game looks interesting, was on my list of games to eventually get. @Zodiak13 what are the other two games in your top 3? I've heard Stella Glow was good, and from your description, sounds like a game I'd like. @Rogue76 Etrian Odyssey IV, and Persona Q. I am a huge RPG fan, of any kind. I also loved 7th Dragon III Code VFD, and of course FE: Awakening. SMT IV and Bravely Default/Second, are also amongst my favorites. Stella Glow is a spiritual successor to the Luminous Arc series on the DS. @Zodiak13 nice I have Etrian Oddessy IV too, fun game. I haven't played the others; I don't have a Vita, but Dungeon Travelers 2 sounds good. I'm a huge rpg fan as well, I logged a ton of hours into DQ9, and just got DQ8, which I'm enjoying, but not as much as 9. I also want to get Bravely default series, I just have way too many games right now.